Lorna Nanda Gangotra is one third of The Gangotra Sisters, winners of the BBC2's ‘The Big Family Cooking Showdown 2017’. 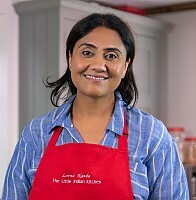 Lorna founded The Little Indian Kitchen in 2009, following the decision to give up her corporate career and take the plunge into the world of food. Originally located in Wimbledon, the kitchen hosted regular cookery classes during the week and it served as a local bistro on the weekends. After a couple of successful years, Lorna closed the kitchen to start a family and move to Surrey. She spent the next year raising her children before a chance encounter with a friend led her to discover Ripley Farmer's Market. It was there that she resurrected The Little Indian Kitchen by taking part in the monthly markets. The Little Indian Kitchen attends a number of food festivals across the country. In addition, Lorna continues to offer tailor made cookery classes at people's homes and event catering, and now attends both Ripley and Kew Village Farmers’ Market monthly.